Got a FAQ? See if we can answer your questions here. You need to be able to walk at least 1/2 a mile, but not all at once. We walk a little, stop, walk a little more..you know -- like most walking tours. But we do go up a moderate hill for the last part of the walk, and then we return back to the starting point. You have to be "in shape" enough to cover that distance. Is our walking tour family friendly? OK for kids? Is our walking tour wheelchair accessible? What about bringing along dogs? Cats? Iguanas? Bringing pets is not a good idea. Are there bathrooms available along the way? How long is our walking tour? It's about 1/2 of a mile and about 90 minutes. Find our group and get the ticket with your name on it. Our walking tour is outdoors. Listen to your mom. What if the weather is nasty? We cancel if it snows. Click here to see our ticket page. Can I just show up and buy a ticket? Yes, tickets at the door are $25 cash. Can I give my ticket to a friend and have them go in my place? 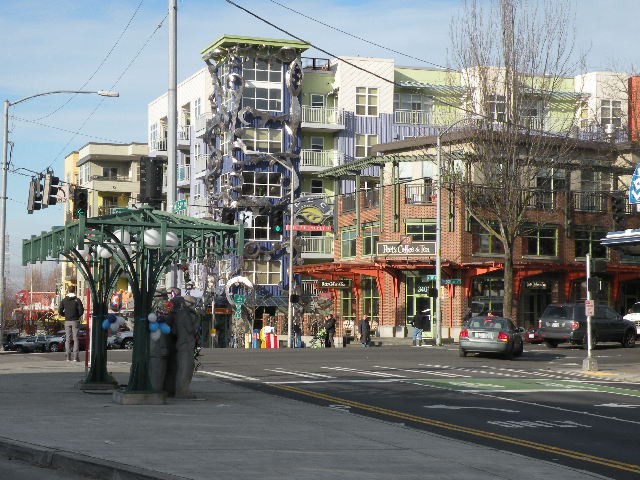 Solstice Plaza is at 711 N. 34th Street, Seattle WA 98103. It is a sunken plaza at the Quadrant Lake Union Center. There is street parking for up to 2 hours. There is a parking lot just across the street from Solstice Plaza. Most people will need to park longer. Is there a place to park a large bus for a group tour? Just ask us! You can call or drop us a line. If it has to do with the tour, we’ll be glad to help. If we don’t know, we’ll make up an answer just for you. Still have questions? Give us a call at 206-417-7774 or drop us a line.